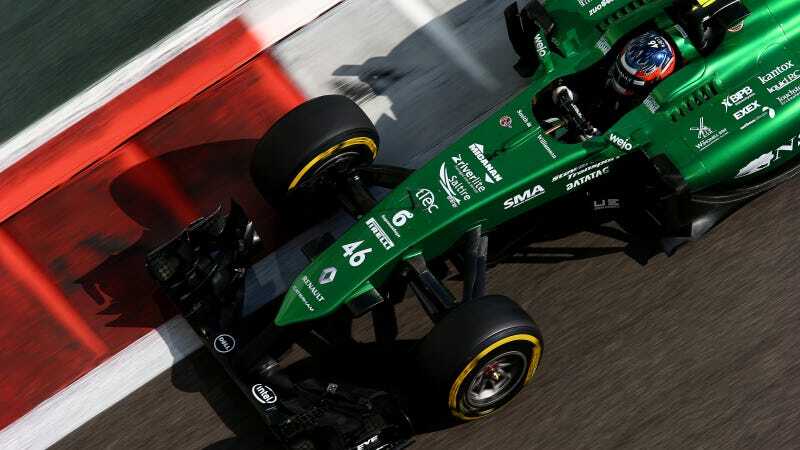 Despite their success at promoting their business partners at Crowdcube crowdfunding Caterham's return for the last Formula One race of the season, the administrator over the team has opted to put the team's assets up for auction. They're done. Administration is like Britain's form of bankruptcy protection, and Caterham has been in it since October of last year. While Marussia met a similar fate at roughly the same time, Caterham's administrator, Smith & Williamson, felt it was easier to find a buyer for the team if they kept racing. So, unlike Marussia's quick move to auction off its remaining assets to pay for the team's outstanding debts, Caterham has dragged things out a bit. Never mind not having any staff back at the headquarters of how out of his element administrator representative Finbarr O'Connell was playing team principal at Abu Dhabi. They're still technically participating, guys! Okay, I'll say the "t" word if no one else is going to: trainwreck. It's been a bit of a trainwreck. Pop yo' popcorn, hunker down in front of the news feed, full-on Miley-Cyrus-grade trainwreck. That probably has a lot to do with the fact that they couldn't find a buyer. What use is it buying a Formula One team when they've publicly admitted that they haven't developed their car much and plan to run last year's outdated model when/if they made it to any races in 2015? That's not racing, that's a parade lap, and likely to fall outside the 107% rule for minimum lap times. RACER reports that auction firm Wyles Hardy & Co. will auction off what's left of Caterham's assets in a series of auctions throughout March and April. Need simulator equipment, or the factory and race tools used to build and campaign a Formula One car? Or what about one of the best looking cars from the 2014 grid? Both chassis and show cars will be on sale at the auction. As always, we'll pick through the most interesting items for sale as soon as we see them. Given that they've lasted a tiny bit longer before going to auction, maybe they'll have larger wallets than Marussia.